Paddy Scott is easily the least known of all the scoundrels, rogues and reprobates who have troubled our local waters. This is strange, since during a 20-year span he was regularly condemned in newspapers nationwide for “vile outrages” perpetrated from his “piratical encampment” at Mobile Bay. He was a chronic irritant to authorities from New Orleans to Pensacola, who chased and jailed him multiple times, but he always managed to escape or win release, only to turn pirate again. ​For reasons unknown, Scott decided to shift his nautical skills toward nefarious purposes. By 1824, he and 10 Spanish seadogs had stolen a launch with a shot hole in her gunwale and were regularly vexing Mobile-area captains. One evening these outlaws boarded a British vessel in the lower bay and demanded liquor and food from the surprised crew. A witness later said that the Spaniards “made Scott, alias Glass, their commander. The public will do well to be on their guard.” The inspiration for Scott’s new moniker was likely the frontiersman Hugh Glass (subject of the 2015 film “The Revenant”), whose survival story was then much in the papers. Scott was still a nuisance two years later. The Pensacola Gazette reported that he and a sidekick called Smiley were “hovering in and around Mobile Bay” and had made Fowl River their “rendezvous.” Their preferred modus operandi was to target an unsuspecting vessel and overtake it. On board their small sloop, the John Fowler, they were “armed with muskets, pistols and sabers, all in good order.” Before long, the diligent Revenue Marine (precursor to the Coast Guard) discovered the John Fowler off Horn Island and compelled her surrender. Scott and Smiley were unceremoniously thrown into the Port City calaboose. Their buccaneer friends quickly hatched a plot to free them, but according to the New York Daily Advertiser, the plan went awry. The would-be rescuers were discovered and pursued “but affected their escape in a boat.” As it turned out, authorities weren’t able to hold Scott and Smiley long. The dastardly duo shucked their manacles, clobbered the jailer and skipped town. Sometime in 1827, the Collector of Customs in New Orleans wrote his Mobile counterpart, warning him about the brown-water pirate. “Sir,” he began, “I deem it my duty to inform you that information has been given me that a small schooner (The Fanny) of about 17 tons burthen has been stolen by a party of desperadoes with the notorious Paddy Scott at their head, armed with muskets and knives, with the intention of a piratical cruise.” He recommended his colleague dispatch “the revenue cutter belonging to your station to take them and send them here for trial.” It was not to be. Scott and his associates ditched The Fanny and commandeered a new vessel, the Lalla Rookh. This little 10-ton sloop looked every inch the pirate ship with her raked mast and blacked topside. Scott and his men prowled the Mississippi Sound with her, where they stole a whaleboat, issued “impudent threats to those on shore” and generally annoyed everybody. Like most petty thieves, Scott was an opportunist, and he sometimes acted alone if the occasion presented itself. In the fall of 1832, for example, some visiting Charlestonians, ignorant of his reputation, hired the “lawless depredator” to convey them from Bay St. Louis to Biloxi on board a schooner. According to the Philadelphia National Gazette, the party requested a slight course change so they could hunt on a nearby island. During their absence, “the piratical scoundrel … cast the boat adrift and put out into the lake, and succeeded in making his escape.” The paper declared that he was “remarkably apt” at such matters and urged his capture. It came quickly. Armed men nabbed him and returned the hunting party’s stolen baggage. The record doesn’t indicate whether or not Scott was jailed for this offense, but he quickly returned to his old ways. ​Scott and company next descended on the Eastern Shore, where they stole cattle and terrorized residents. 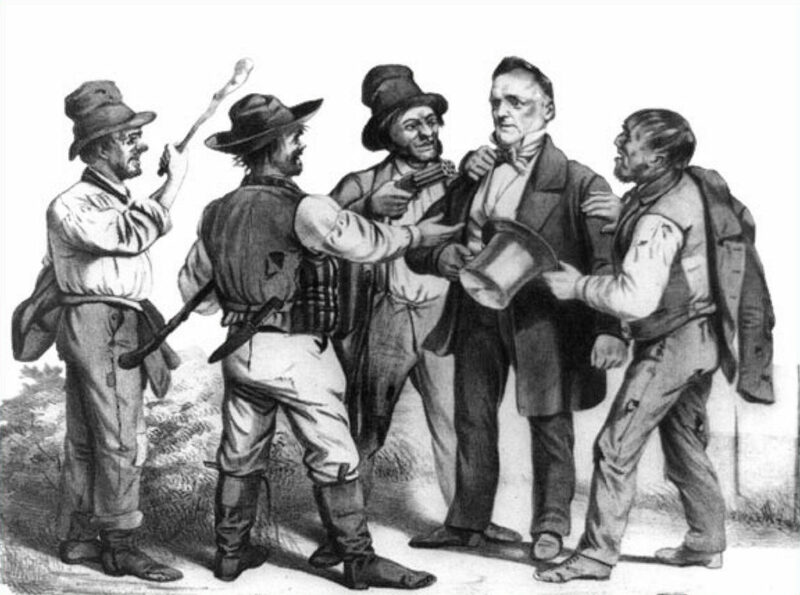 The Baltimore Sun decried their “vile outrages,” and a local citizen lamented “the exposed situation of the people.” Authorities from Pensacola, Mobile and New Orleans coordinated an unusual land/sea effort to apprehend the bandits. Scott ducked them and lighted at New Orleans again. Incredibly, he made no effort to conceal himself. The Times-Picayune reported him brazenly “walking about our streets” and noted that there was a $500 reward for him at Mobile. “Catch him, someone,” the paper helpfully suggested. Crescent City police soon collared Scott for vagrancy, but they said there was no evidence to hold him for the alleged Baldwin County crimes and let him go. ​An act of murder brought his buccaneer days to an end. In New Orleans, shortly after New Year’s Day 1840, Scott stabbed a man in the back and then hurried back to Mobile. Unfortunately, continually shifting bases was no longer an effective strategy for him. He was infamous everywhere and easy to pick out of a crowd. As Nile’s National Register wrote, he had “a pale face” and was “above middle size.” More significantly, Scott was “on the wrong side of 40” in places thronged by young men. Mobile authorities arrested him and extradited him to the Crescent City where he stood trial. The old pirate proved a coward before the judge. “He is an idiotic, mindless-looking man,” said one disgusted observer, “and apparently devoid of all physical courage.” Scott was sentenced to hang; however, the jury took pity and asked the governor to spare his life. It was done, and Scott spent his few remaining years piloting boats on Lake Ponchartrain. His final resting place is unknown, memories of him all but vanished. Still, his stories are there in yellowed newspapers and foxed letters. One has only to read these to imagine Paddy Scott’s piratical spirit once again at large. John S. Sledge is the author of ‘The Gulf of Mexico: A Maritime History,’ due Fall 2019 from the University of South Carolina Press.